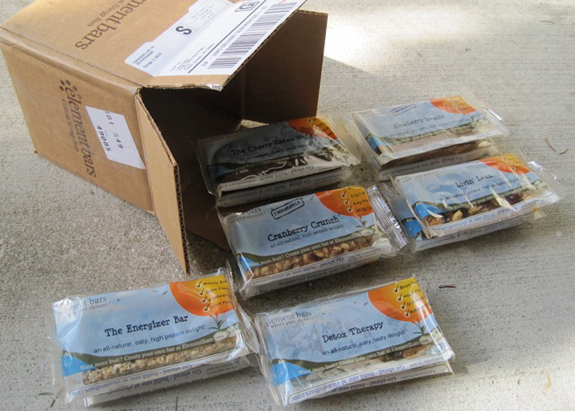 A Daily Dose of Fit: WIN THIS: An entire box of Element Bars! When I was little, I'd spend my summer months hanging out at my grandparents' house because both of my parents worked full-time. Aside from the salami and cheese sandwiches, I vividly recall watching a lot of game shows. Particularly "Press Your Luck" and "Win, Lose or Draw." Also "Double Dare," but that was on Nickelodeon and I didn't always get control of the channels. These shows had very different rules, but they all shared one thing in common—the faceless announcer that described every prize in great detail, usually beginning with "...and you could win this..." as said prize was unveiled before the excited contestants. 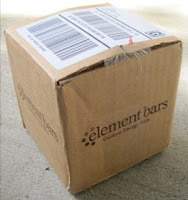 A fabulous box of Element Bars! Yep, no lie. You really can win it. Or at least one like it, because the bars you see above were sent to me by the company so that I could taste and review them. As you know, I am a huge fan of granola bars. So when I came across Element Bars at Club Industry, you can imagine how excited I was to learn that they're filled with nutritious goodness. I tasted the Cranberry Crunch and Blueberry Bliss, after which I fell in love—after which I knew you must know about them, too. The company itself is based in Chicago and is the brainchild of a small group of people just like you and me. Active people who want granola bars that complement their fit lives, rather than derail them with the likes of high-fructose corn syrup and other unrecognizable ingredients. Active people who baked their own bars in protest. But you and me, we don't always have the time to bake our own bars. And that's where Element Bars come into play. They bake the bars for you. You get to choose from a great selection of all-natural, unprocessed ingredients and you can even name your bar. Fun, right? I would call mine "Pumpkin Perfection" and it would start with an oaty core, followed by cranberries, flax and pumpkin seeds, then some pumpkin spice. Seasonally appropriate, no? Or, you can simply choose from a number of already successful recipes posted on their site. 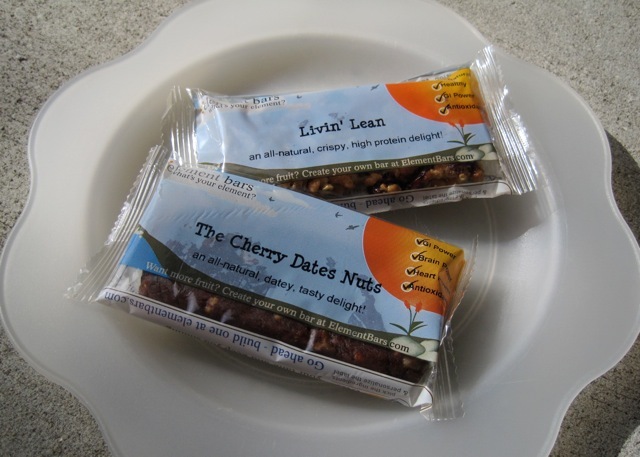 Livin' Lean and The Cherry Dates Nuts were both included in my sample pack. So I sampled them and will very willingly admit that they were delicious. Livin' Lean (left) was a crispy, fruity and somewhat nutty experience I won't soon forget. Sort of a classic granola bar, but without the classic cardboard flavor that so many conventional granola bars offer up. The Cherry Dates Nuts (right), on the other hand, was soft and gooey and very much like a delicious piece of fudge. Or a Pure bar. Needless to say, both will be great snacks before and potentially after I teach a fitness class. Or as a mid-day snack. My only concern? And really, this is a general concern that I offer up regarding any granola bar, keep an eye on the calorie count. Those pesky calories can add up, but in the case of Element Bars, they are quality calories that will go a long way in terms of your nutrition. And speaking of your nutrition, let's get you a box of customized Element Bars. Well, that is...if you are my one lucky winner. To qualify—yes, seriously! I'm really doing this! To qualify, jump on over to Element Bars and start building your custom energy bar. Then, come back here and leave a comment on this very post before midnight EST this Friday, October 29, 2010. Give me your list of ingredients, and tell me what you'd name your bar. And if you sign up for my emails, I'll put your name in the pot twice—bonus chance! How's that for awesome? So let me know if you do that, too. Remember, you must comment at the bottom of this post. Emailing me doesn't count! And all comments must be made before midnight EST this Friday, October 29, 2010 to qualify. The winner will be chosen at random and announced this Sunday, October 31, 2010. Best of luck to all of my readers! My "40-Miler" is chewy (peanut butter) with honey, cashews, pumpkin seeds, peanuts, cherries, blueberries and omega 3 boost. "Delicious Defiance" (so named because I put all of my favorite things in it - but yet it is still healthy!) - chocolate chips, honey, peanut butter core, flax seeds, soynuts, and fiber boost! Love the contest idea! 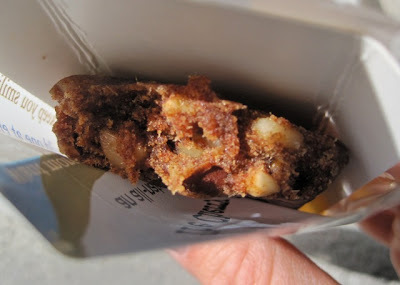 This bar has a chewy core with almond butter, cherries, honey, flax seeds, pumpkin seeds, soy protein, and walnuts. It's called "Extravaganza!" because I want it all! I receive your blog through email already so I can read it during my prep period at school. 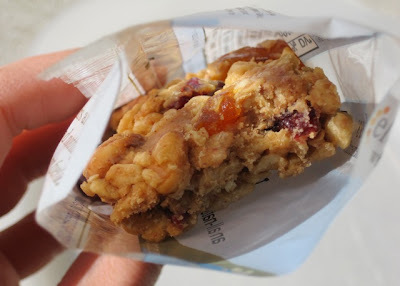 Chewy almond butter core with apricots, walnuts, cherries, fiber and immunity boost. I'd call it "Nut Job with Fruits"
"Fix You Up" Immunity boost to fix your immune system. Almonds, flax, blueberries to help you along to fix your core. And a little chocolate chip to fix your sweet tooth. Chewy Peanut Butter Core, Raisins, Chocolate Chips, Pumpkin Spice, and Whey Protein. I would call it Autumn Delight!